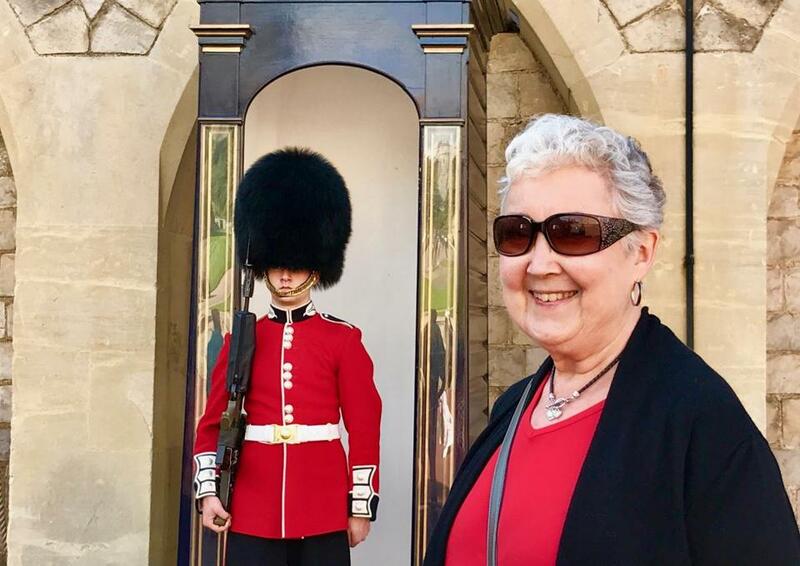 Susan Muther, the author’s mom, watches the changing of the guard at Buckingham Palace. LONDON — As soon as the plane descended from the low clouds and the landscape appeared beneath us, she started crying. The patchwork of fields in the British countryside seeped into the suburbs, and eventually the fringes of London came into view. She started crying again. I wasn’t sure what to do. I don’t think I’d ever seen my mother cry quite like this. So I put my arm around her, and rubbed her shoulder. “We’re here,” I said. This only made the crying situation worse. All of this weeping can be traced back to Christmas, or maybe it was Thanksgiving, about three or four years ago. After whatever large mound of ham I consumed, I passed out on my parents’ sofa at their house in north central Massachusetts. Sensing a captive audience, my mother, Susan, suddenly appeared beside me with a file folder stuffed with ancient black-and-white pictures. I was about to get an unrequested family history lesson. She flipped through faded faces of elderly women in simple cotton print dresses at summer family reunions in the 1940s and 1950s surrounded by their well-groomed children. So, so many pictures. So many reunions, plus black-and-white portraits of prim relatives taken in London during the 1800s. There was no stopping her. My mother started climbing her family tree, and, like millions of other Americans who have joined Ancestry.com or sent away for DNA tests, she was obsessed with her genealogy. She furiously worked off of half-finished and slightly inaccurate family trees, sleuthing her way through branches like a latter-day Jessica Fletcher. I’ve yet to fully comprehend my mother’s family tree, but here is the very abridged, Reader’s Digest, extra-large print version. Around the turn of the last century, my great-great-grandfather, Albert, left London and moved to Massachusetts — Athol, to be exact. Four of his siblings also moved to the States, two stayed in England. My mother was told that those who stayed behind were not happy with the departed siblings. I’d like to imagine the whole thing went down like a “Downton Abbey”-style Lady Mary and Edith catfight. Mind you this is just one side of one family. She’s traced the genealogy for both of her parents, but I don’t dare ask about it lest I risk more postholiday lessons. My mother has, to date, sworn off all DNA tests because she is certain of her British heritage. But the clotted cream really hit the scone when she found a pair of British cousins on Facebook. Conversations began with the UK kin, and she grew more excited as she added pieces to the family puzzle. It was at this point that I decided to do something I’ve never done. I decided to be a good son. I told my mother I was taking her to London to meet her British cousins and visit the neighborhoods where her family once lived. This was the first round of crying. She had never been to England, but told me she always dreamed of visiting. I suppose a good son would have known that his mother had always dreamed of going to England. All of this crying was a bit off-putting. My mom’s usual means of conveying emotion was through icy stares and sarcastic quips. Perhaps this crying business is how good sons are treated. Our British genealogical adventure would represent another first. I had never taken a vacation with my mother. Our longest solo mother-son excursion was a day spent at Ikea. As I recall it was a long day. Our trip to England would stretch a full week. Could I really survive seven days alone with my mother? If that wasn’t stress enough, my mom began referring to the trip to London as “the trip of a lifetime.” I’m pretty skilled at planning trips, but I’ve never planned someone’s dream vacation. While I went about the business of assembling an itinerary, my mother reached out to her British cousins. On our first full day in London, once the tears had dried, we met with our cousin Pat. She graciously traveled two hours from the English countryside into the city to see us. I saw the similarities immediately. Cousin Pat showed up with a folder stuffed with black-and-white photos, a family tree, and letters written by long-departed family members. One of the rings in my family tree must involve genealogy hoarding. My mother and Pat sat down for coffee and began sifting through pictures. There, among the documents Pat brought, was my great-great-grandfather’s vaccination record, dated September 1876. I could practically see the sparks coming out of my mother’s ears as she put more pieces of the family puzzle together. Pat told my mother that we were the first US relatives to come back to England since Albert and his siblings left more than 100 years ago. I had tissue ready in case my mother started to cry. At several points during the trip I interviewed my mother. I suppose normal people would call this conversing. Just after cousin Pat left I conducted the first interview. Thanks to the lovely Pat, the trip of a lifetime started on a high note, and it was up to me to make sure it stayed that way. Given her Anglophile leanings (we’re talking about a woman who has suffered through Jeremy Piven in four seasons of “Mr. Selfridge”), the logical first activity was high tea — also known as what gay sons do when they travel with their mothers to England. With the refrain “trip of a lifetime” running through my head, I found what I believed to be the finest afternoon tea in London. We went to Claridge’s Hotel in the fashionable Mayfair district. It’s hosted both British and Hollywood royalty. They’ve been doing tea for 150 years, so I assumed they likely knew a thing or two about making a decent scone. They’ve even published a cookbook. Because neither my mother nor I actually care for tea, I opted for the champagne tea package. Perhaps the booze would give the whole experience that special, rosy “trip of a lifetime” sheen. It turns out we didn’t need the champagne to have a good time. For about $100 per person we spent the afternoon stuffing ourselves on dainty sandwiches and substantial pastries in the art deco dining room. Claridge’s tea would be difficult to top. Like a DJ who plays the best song of the night too early, I was afraid I may have peaked on the first day. But London is an impressive city, so I kept my mom moving at a rapid clip through the history and grandeur. She’s also quite fond of Shake Shack, so we visited often. I know it’s not British, but I was trying to keep the sarcastic quips and icy stares to a minimum. 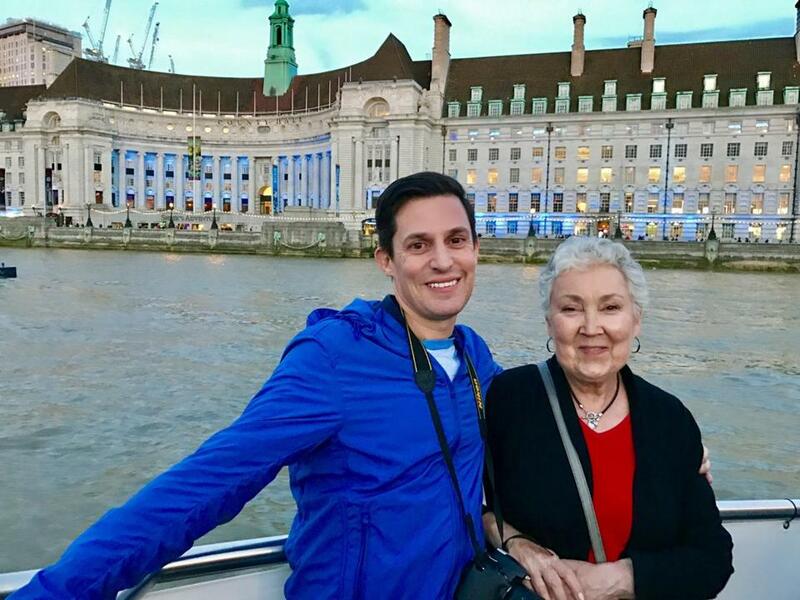 Christopher Muther and his mother, Susan, on a sunset cruise of the Thames River in London. I began taking her through the London bucket list: Changing of the guard, Tower Bridge, sunset cruise of the Thames, shopping at Harrods, Trafalgar Square, and fish and chips. The majority of our days were spent walking all over the city and marveling over the age of our surroundings. We happened to arrive at Westminster Abby when Saturday afternoon church service was beginning. About halfway though the service I heard her crying again. It was time for another interview. “It was a combination of the architecture, the history, the choir, and just being here,” she explained. Windsor Castle was another emotional moment for mom. She was wearing her British great- grandmother’s wedding ring, which she’s worn as long as I can remember, and placed it on one of the walls of the castle. I think she told the ring that it was home. Either that or she was talking to herself again. She tends to do that. With the mantra “trip of a lifetime” still buzzing in my ear like a stubborn mosquito, it was time to up the ante once again. 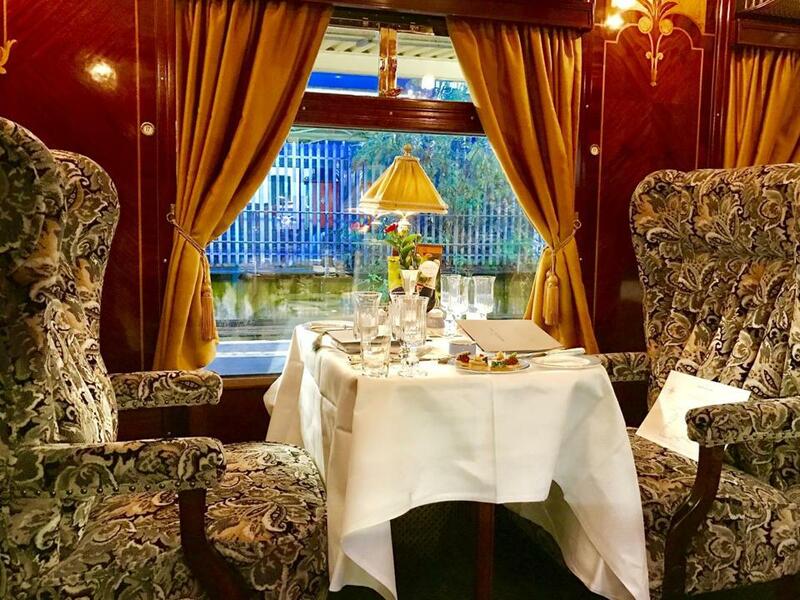 I booked us a seven-course dinner on a beautifully restored 1920s Belmond British Pullman train. Everything about the experience was exquisite. This was like living in an Anne Hocking novel without the blood. The only glitch was that I didn’t realize we were dining in a VIP car until the day of the trip. My mother isn’t known for her fashion acumen — I think she still sometimes wears a sweatshirt with lighthouses on it — and I didn’t pack any formal wear. We scrambled to put something together that said “black tie.” The best we could manage were ensembles that screeched “JC Penney mother-son half-price portrait day.” I kept my head low and enjoyed the meal. A dining car on the Belmond British Pullman train. All of this was leading up to meeting the second British cousin. In her research my mother found cousin Jeremy. This is a man who knew the family history, down to addresses and cemeteries. He arrived with more pictures, a highly detailed tree, and old maps of Bethnal Green, the London neighborhood where my ancestors once lived and worked. 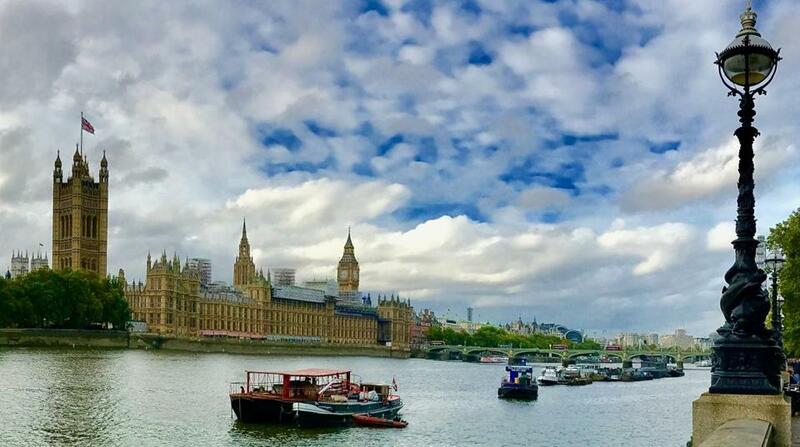 London as seen from the banks of the Thames River. I was surprised that my mother was able to keep her composure as Jeremy filled in more branches. We strolled on the narrow streets where relatives once walked to their manufacturing jobs. We went to the imposing church where family weddings and christenings took place. Sure, the church was now a refuge for junkies, n’er-do-wells, and felonious fellows, but I still made my mom stand in front of the church for a photo. “Can you step back a little more?” I asked, directing her closer to the whiskey-scented klatch passed out on the steps. She gave me the familiar icy stare. This, my friends, is how memories are made. The once working-class neighborhood’s architecture is surprisingly intact. It gave us an idea of what life was like for those relatives before they departed for the United States in 1902. The next day we went back and explored the neighborhoods further after another authentically British Shake Shack lunch. Almost every morning I placed a London guidebook in front of my mother and asked her what she wanted to see. She would offer up some kind of nebulous answer, and the question of the itinerary came back to me. Perhaps she was thinking that her travel writer son should get off his duff and produce an Excel spreadsheet with endless, chipper fun activities for each day. But in my final formal London interview with my mother, I learned it was quite the opposite. These tearful words opened up my eyeball faucets as well. “You mean I could have left you at Shake Shack for the week and you’d be happy?” I asked, trying to prevent the scene from getting too soggy. “You loved it, and you know it,” she shot back. Despite my initial fears, I did love it. It’s not often you get an opportunity to plan and share someone’s trip of a lifetime, especially your mom’s. Christopher Muther cam be reached at muther@globe.com. Follow him on Twitter @Chris_Muther and on Instagram @Chris_Muther.